We can provide you a Magtek card reader to connect to your Windows PC via USB. We recommend using our encrypted HID and Key Emulator readers but we also offer unencrypted HID and Key Emulator versions as well. The HID version is what you need to use with our free SwIPe software. The Key Emulator version can be used to enter card numbers directly into the Virtual Terminal. 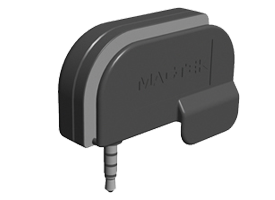 The new Magtek IPAD® SC is a great USB signature capture and card reading device. Tranzcrypt.com’s SwIPe software fully supports the signature capture functionality and stores the signature in the gateway for you eliminating your need to save paper receipts. PCI 2.x Compliant. USB Powered. Signature Capture. Prevent personal cardholder data breaches without compromising the speed and convenience of your cardholders’ financial transactions with IPAD SC. The advanced design of the IPAD SC combines the functionality of a traditional PIN pad plus the convenience of an integrated signature capture pad, and the data protection of a 3-track MagneSafe™ secure card reader authenticator, secured by the MagneSafe Security Architecture. It is the most comprehensive, end-to-end security solution available. IPAD SC immediately encrypts data at the point of swipe so personal information is never “in the clear.” And using MagTek®’s advanced MagneSafe security features, ATM, debit, credit, gift cards and more are authenticated using MagnePrint®, a dynamically generated digital identifier already part of the magnetic stripe card used to render any counterfeit or cloned cards useless. With IPAD SC, encryption takes place within an encapsulated magnetic read head as the card is swiped eliminating the chance of intercepting clear text data. As a result, the data is never “in the clear,” even for a few milliseconds. IPAD SC’s data encryption scheme uses industry standard Triple DES and AES giving you the flexibility to manage decryption services yourself or via an outsourcing service, without the risk imposed by unproven, proprietary encryption algorithms. IPAD SC uses a 32bit security processor and has flexible data formatting and masking capabilities for maintaining compatibility with existing software. MIPS32 4KSD RISC processor with included RAM and Flash memory, USB 2.0 full speed connectivity, real-time clock, and battery-powered security protections. IPAD SC also supports secure remote key injection eliminating the need to return the unit in the event a new key is required. 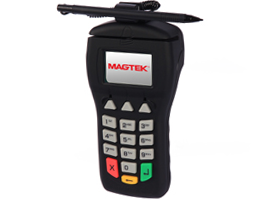 MagTek’s cost-effective key injection service ensures that our PIN encrypting devices (e.g., IPAD® and IntelliPIN®) and encrypting MagneSafe™ secure card reader authenticators will be deployed with full security integration prior to deployment with no need to ship the units to a third party for key injection. Additionally, a detailed shipping report with itemized data including serial numbers help MagTek to furnish a comprehensive audit trail for each device. Are most of your transactions key entered? Have you ever taught about the consequences of that keyed in card data being stolen from your PC from a key logger or virus? The ID TECH M130 uses our Point To Point encryption technology to safely capture that sensitive card data either through key entry or by swiping with the built in card reader. The SecureKey M130 is an encrypted keypad with a magstripe reader that offers retailers a complete and reliable security solution. This intelligent reader delivers superior reading performance while encrypting sensitive magstripe and keyed-in data that reduces the scope of PCI-DSS. 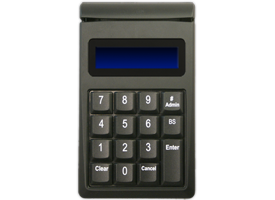 The SecureKey M130 ensures all data transactions are protected from end to end reducing fraud and data compromises. 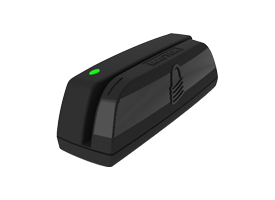 The SecureKey M100 is also available, with all of the same features as the SecureKey M130 but without the magstripe reader. The PS Enterprise Encrypted Mobile Reader works with a wide variety of mobile platforms, including Apple and Android. It allows merchants to make secure transactions while on-the-go using mobile devices and connecting through their mobile headphone jack or USB connections. The secure card reader authenticator uses the MagneSafe™ Security Architecture to protect cardholder data through instant dynamic encryption, tokenization and authentication.